sjhoward.co.uk » Why does the Government think we’re all stupid? Why does the Government think we’re all stupid? I’ve been intending to post for ages on the subject of patronising, irritating, and most certainly excessive Government advertising. I have found recently that it’s impossible to watch a single commercial TV programme without seeing at least one Government funded advert, whether it be for direct.gov, the road safety Think! campaign, the NHS Stop Smoking campaign, car tax renewals, Fire Kills, the Know Your Limits alcohol campaign, the ubiquitous Change4Life, the Act FAST stroke campaign, Act on CO2, the Food Imports campaign, the irritatingly clever Get On ads, or any one of the miriad campaigns the Government is funding at any one time. Listening to the radio is worse. And even Spotify has been invaded. Government posters are everywhere – the recent slightly threatening Policing Pledge ones are spreading like a rash, but my personal favourite is the Food Standards Agency one shown here. 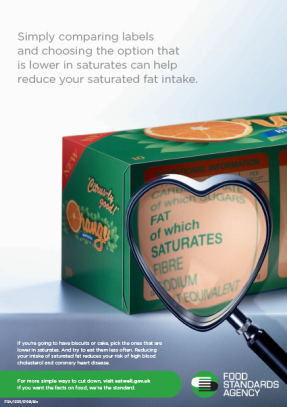 Apparently, choosing something with fewer saturated fats helps me reduce my saturated fat intake. Well, duh. These adverts are even invading cash machines. I’d never really noticed cash manchine adverts before – are they new? – until one had an NHS advert on it, with someone sneezing in my face. But all of this came to a head yesterday. Whilst wandering round Eldon Square, I found no fewer than three government supported advertising stands. One was for Change4Life, there was one advertising the local NHS Walk-in Centre, and one talking about reducing CO2. All in the same shopping centre, at the same time. This is nannyism taken to another level. What on Earth is the cost of all of this manifest advertising? It surely must be huge. Now no-one in their right mind would argue with some of the campaigns – fire safety is important, the Act FAST campaign is a major attempt to get people to re-think stroke, and road safety is in everyone’s interest. But there’s a difference between informing the public and forcibly ramming things down their throat. The Conservatives have posited Government advertising as one of the big areas in which they can reduce waste. Frankly, the sooner they get the chance, the better. This 1,393rd post was filed under: Media, News and Comment, Politics, Advertising. Comment posted at 17:24 on 2nd April 2009. Comment posted at 19:44 on 14th October 2010. Just to let you know that today is World Autism Awareness day. Comment posted at 13:31 on 16th February 2011.
prison inmates. setting them free before their time. making vat 20%. as i said i could go on and on.